Saddle up! Whether you're a true cowboy or a city girl with a dream, the unisex Minnetonka 9513 Brown Ruff Leather Buffalo Nickel Distressed Hat will make you feel like you're riding out into the open range. 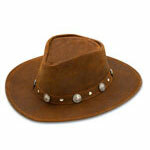 This brimmed hat is crafted from brown, Ruff Distressed leather for that rugged, outdoors look. It features Buffalo Nickel metal accents all around for a little style and flair. The hat is made with steel wire hidden in the edge of the brim which allows personal shaping and a great fit. Put a little needed western style into your life! A great gift for mom or dad – bring out their western style!